Shoe Inn dispensers have always been great at helping you quickly and safely put shoe covers on, and now we can take them off for you too! The Shoe Inn ASCR-10 Shoe Cover Remover, which has been designed to complement the look and functionality of our Shoe Inn shoe cover dispensers, is ideal for low- to medium-volume uses. 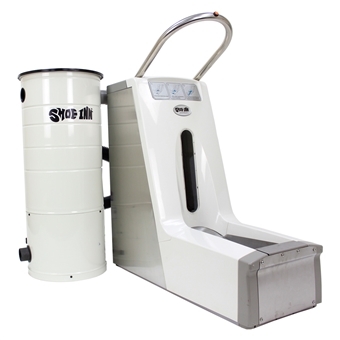 This automatic shoe cover machine has a canister that holds 100 or more disposable shoe covers, depending on the type of shoe cover used, and can be used with a HEPA filtration bag. Because it only requires a standard 120v electrical outlet, the Shoe Inn ASCR-10 can be easily deployed at any suitable location. This ergonomically-friendly automatic shoe cover machine is perfect if you need a shoe cover remover for low- to medium-volume usage. Combined with Shoe Inn automatic shoe cover dispensers, it's ideal for use in a variety of environments such as manufacturing or food processing plants, laboratories, cleanrooms, medical / healthcare facilities, or anywhere you need to have shoe covers applied and removed quickly to achieve maximum productivity, cleanliness, and safety. 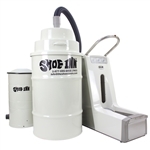 Please note that this shoe cover remover can be installed in the location where shoe covers are typically removed and the 10-gallon canister/power unit can be located elsewhere if necessary (up to approximately 250' away). Please call to discuss the design requirements of your specific situation and if you would like us to quote the remote installation setup pricing (note that Shoe Inn is not available to complete the physical custom installation). Try this automatic shoe cover machine today! Footprint dimensions: 2'8" x 2'8"
Customized removers available! Please ask for details. For low to medium-volume uses, this two-part remover system holds 100+ shoe covers (depending on type).